By Marguerite M. Caré, M.D. Why was this patient referred for imaging from an ophthalmologist? The coronal T2 image demonstrates absence of the septum pellucidum causing the unusual configuration of the lateral ventricles with a flattened superior margin and pointed inferior frontal horns. The sagittal T1 image demonstrates the T1 hyperintense focus of the posterior pituitary in an ectopic location near the hypothalamic region instead of the normal sellar location. The pituitary infundibulum is thin. When these findings are present, the imaging should be reviewed for additional findings of septo-optic dysplasia (SOD). Septo-optic dysplasia classically presents with midline structural abnormalities of the brain including optic nerve hypoplasia, absence or hypoplasia of the septum pellucidum, and hypothalamic-pituitary abnormalities. In patients with SOD, optic nerve hypoplasia is bilateral in almost two-thirds of patients. Almost half of patients will have pituitary insufficiency with imaging findings including an ectopic posterior pituitary, small pituitary gland, and thin or absent pituitary infundibulum. Additional brain malformations such as cortical malformations and schizencephaly are common. When these additional malformations are present, the disorder is sometimes referred to as septo-optic dysplasia plus. Caré MM. 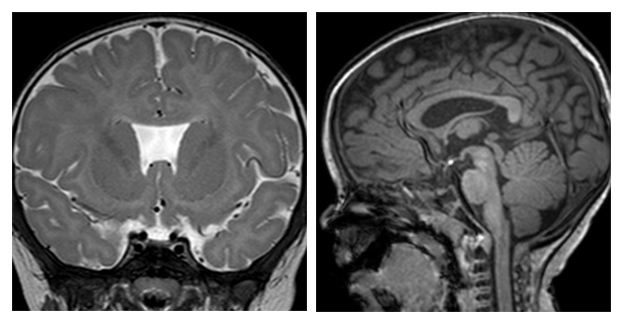 At the Viewbox: Absent septum pellucidum with ectopic posterior pituitary. J Am Osteopath Coll Radiol. 2012;1(1):38. Dr. Caré works with the Division of Neuroradiology, Cincinnati Children’s Hospital Medical Center, Cincinnati, OH.